Celebrate floral colors and shapes in your garden using the Parasol Blue Bouquet-3 Hummingbird Feeder. This lovely item brings jewel tones and floral hints to your yard in moments. A black, metal frame forms a basket, which conveniently holds three glass vessels. The shape of these vessels is based on perfume bottles of the early 1900's, and their deep blue hue brings interest to the item. Each glass reservoir holds 3.5 ounces of nectar, and a red, glass feeding flower inserts into the neck to create a feeding station for the birds. These vessels sit conveniently in the metal frame, and the flower aligns with the perches to offer a resting spot for the hummingbirds. These reservoirs and feeding flowers remove easily from the basket, for thorough cleaning, and the recycled glass construction offers an environmentally friendly item. Connect the basket to a hook or bracket, and place it within your flowers for a natural and fun look. 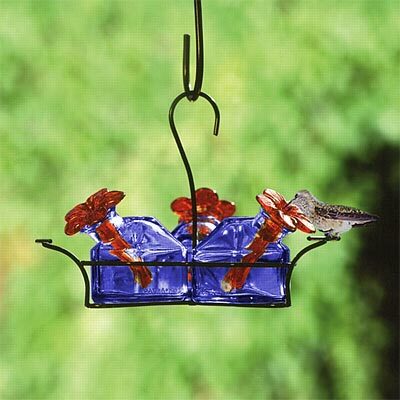 Provide hummingbirds with nectar nestled throughout your sanctuary with this Blue Bouquet-3 Hummingbird Feeder.